(2012). Metal-Ion-Coordinating Properties of Various Amino Acids, Investigation of the Essential Function in Biological Systems regarding to their Nano-Structure. International Journal of Bio-Inorganic Hybrid Nanomaterials, 1(1), 25-32.
. "Metal-Ion-Coordinating Properties of Various Amino Acids, Investigation of the Essential Function in Biological Systems regarding to their Nano-Structure". 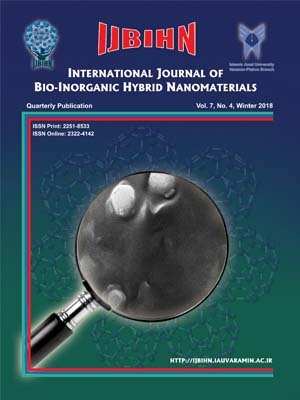 International Journal of Bio-Inorganic Hybrid Nanomaterials, 1, 1, 2012, 25-32. (2012). 'Metal-Ion-Coordinating Properties of Various Amino Acids, Investigation of the Essential Function in Biological Systems regarding to their Nano-Structure', International Journal of Bio-Inorganic Hybrid Nanomaterials, 1(1), pp. 25-32. Metal-Ion-Coordinating Properties of Various Amino Acids, Investigation of the Essential Function in Biological Systems regarding to their Nano-Structure. International Journal of Bio-Inorganic Hybrid Nanomaterials, 2012; 1(1): 25-32. The acidity constants of some amino acids (Am) were determined by potentiometric pH titration. The stability constants of the 1:1 complexes formed between M2+: Ca2+, Mg2+, Mn2+, Co2+, Ni2+, Cu2+ or Zn2+ and Am2-, were determined by potentiometric pH titration in aqueous solution (I = 0.1 M, NaNO3, 25°C). The order of the stability constants was reported. It is shown that the stability of the binary M(Am) complexes is solely determined by the basicity of the carboxyl or amino group. All the stability constants reported in this work show the usual trend. The obtained order is Ca2+<Mg2+<Mn2+<Co2+<Ni2+<Cu2+>Zn2+. The observed stability order for Am follows the Irving-Williams sequence. It is shown that regarding to M ion-binding properties vital differences on complex bilding were considered. It is demonstrated that in MAm complexes, M ion is coordinated to the carboxyl group, M ion is also able to bild macrochelate over amino group. The up mentioned results demonstrate that for MAm complex the stability constants is also largely determined by the affinity of Cu2+ for amino group. It is shown that Am can exert a direct influence on reaction mechanism through different kinds of metal ions and donor groups of Am.